Primitive Baptists from the hills head to a river for a baptism. Baptists in the United States entered the twentieth century at the top of their game. One of the country’s largest Protestant groups, they were heirs of religious awakenings across the previous century: camp meetings, seasonal revivals, and urban evangelistic crusades. Their missionary endeavors spanned the globe, and they maintained colleges and universities across the nation. The oft-ridiculed, sometimes-persecuted colonial sect had become a powerful fixture in American religious life. Baptists “multiply by dividing,” so the saying goes. They unite around the concept of a believers’ church composed of those who testify to an experience of God’s grace through Jesus Christ, symbolized by believers’ baptism. Yet corresponding emphases on congregational autonomy, the priesthood of all believers, and freedom of conscience, plus the Calvinist-Arminian divide, create the possibility of division over issues ranging from Scripture’s authority to the color of paint for the fellowship hall. As the twentieth century began, earlier schisms over slavery and the Civil War remained festering wounds, extended by the South’s Jim Crow segregation and the North’s growing passion for Social Gospel progressivism. Baptist pastor and Rochester Theological Seminary professor Walter Rauschenbusch (1861–1918) envisioned a Social Gospel movement by which Christ’s kingdom, “humanity organized according to the will of God,” would gradually transform individuals and society. Meanwhile Baptist pastor William Miller’s 1840s claim that Christ’s second coming would soon occur had helped popularize the premillennialist idea that the Savior was on the verge of dramatically establishing a 1,000-year reign of peace. Jesus tarried but premillennialism became a major component of early fundamentalist belief and preaching. These dueling perceptions set the stage for disputes. Though the 1910s booklet series The Fundamentals was actually conceived by a Presbyterian, its effects rippled through many denominations, including Baptists. Fueled by charismatic personalities, these controversies divided congregations and often spawned new Baptist coalitions. Modernists are thus evangelical Christians who use modern methods to meet modern needs. Confessionialism is the evangelicalism of the dogmatic mind. Modernism is the evangelicalism of the scientific mind. Since all truth is God’s truth, Mathews and others argued, Christians need not fear new knowledge and scientific discoveries. 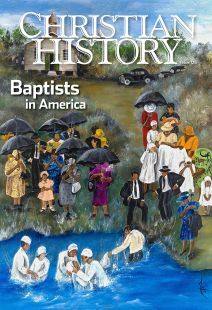 Buy Christian History #126 Baptists in America. Fundamentalists propose to drive out from the Christian churches all the consecrated souls who do not agree with their theory of inspiration. What immeasurable folly! “A fundamentalist is an evangelical that is angry about something,” historian George Marsden once observed. Baptist fundamentalists directed this outrage initially toward two targets: Charles Darwin (1809–1882) and the historical-critical method of biblical studies developed in nineteenth-century Europe. Both, they believed, challenged biblical authority and veracity. Darwin’s Origin of Species (1859) undermined the Genesis accounts of creation, the traditional Christian doctrine of creation ex nihilo (out of nothing), and the belief that humanity was created in the divine image. The infamous Scopes Trial, conducted in Dayton, Tennessee, in 1925, centered around John Scopes’s decision to teach evolution in his science classes, violating Tennessee’s anti-evolution law. Famed lawyer Clarence Darrow (1857–1938) defended Scopes with ACLU support, while the prosecution secured William Jennings Bryan (1860–1925), nationally known orator and erstwhile presidential candidate. T. T. Martin (1862–1939), known for his popular creationist book, Hell and the High Schools (1923), conducted a revival in Dayton during the trial (see issue 107, Debating Darwin). Fundamentalists defended a set of 14 nonnegotiable doctrinal fundamentals, which they asserted as a historic Christian response to modernism. Five points have endured as definitive of the movement: 1) biblical inerrancy; 2) Christ’s virgin birth; 3) his substitutionary atonement, taking upon himself the punishment deserved by sinful humanity; 4) his bodily resurrection; 5) his literal second coming. In the South J. Frank Norris—a fierce populist called “the Texas Tornado”—brought monkeys into the pulpit to attack evolution and declared that preachers who take “the Bible allegorically and figuratively“ preach “an allegorical gospel which is no gospel.” Norris accused even the Southern Baptist Convention (SBC) of harboring liberals, ultimately departing to lead a movement of Independent Baptists who affirmed the Five Points and the absolute autonomy of every Baptist congregation. They rejected institutionalism, particularly “unbiblical” mission boards, preferring to fund and commission missionaries from each congregation. Independent clergy formed loose-knit pastor-coalitions including the Baptist Bible Fellowship, the Premillennial Baptist Missionary Fellowship, the World Baptist Fellowship, and the Southwide Baptist Fellowship. Most insisted that Baptists are the only true church, in direct succession from New Testament congregations. They also pledged to avoid all contact with liberals. Thus many boycotted Billy Graham’s evangelistic crusades because he permitted Roman Catholic and mainline Protestant clergy to participate in those gatherings. Independent Baptists were aggressively evangelistic, building some of America’s first megachurches. Many founded their own Bible schools, suspicious of liberal influence on traditional colleges and seminaries. William Bell Riley (1861–1947), pastor of First Baptist Church, Minneapolis, founded the Northwestern Bible School (1935) and college (1943); Billy Graham succeeded him as president in 1947. Riley attempted to purge the Northern Baptist Convention of liberals and to require a denominational confession of faith for missionaries and professors at NBC-funded schools. When the denomination rejected those efforts, a frustrated Riley moved toward the World Christian Fundamentalist Association, a Baptist-dominated group that had funded Bryan’s work in the Scopes Trial and promoted fundamentalism in numerous denominations. This laid the foundation for a formal NBC schism and the formation of the Conservative Baptist Association of America in 1947. While the SBC also lost members to Independent Baptists, it avoided formal schism because of its long history of conservativism, a leadership that resisted fundamentalism, and its emphasis on evangelism and religious experience as the source of unity. Southern Baptist Theological Seminary president E. Y. Mullins (1860–1928) contributed an essay to The Fundamentals in which he linked doctrinal orthodoxy with the experience of regeneration. Bill J. Leonard is Dunn Professor of Baptist Studies and professor of church history at Wake Forest University School of Divinity and author or editor of over 20 books, including Dictionary of Baptists in America, Baptist Ways, Baptists in America, and The Challenge of Being Baptist.